Affordable cabinets that look stunning seem as though they are impossible to come by. Either you shell out an arm and a leg for the cabinets you want, or you pay much less and receive subpar cabinets in exchange. It’s a catch 22, or at least it seems that way. However, when you choose Reborn Remodeling Solutions as your cabinetmaker, we will provide you with affordable cabinets that will leave you in awe of the sheer beauty of our products. Walk you through our design center and, along with a Reborn Remodeling Solutions bathroom or kitchen designer, pick out your choices from an enormous selection of wood species, door styles, stains, glazes, and hardware. Manufacture and hand-finish all-new cabinet doors, drawer fronts, and veneers in our state-of-the-art Anaheim facility. Remove your existing cabinet doors, drawer fronts, hinges, and hardware. Install your new doors, drawer fronts, hinges, and hardware to transform your old cabinets and give them new life once again. Finish off the job by installing crown molding above your affordable cabinets for an added luxurious touch that completes the look. Beyond just affordable cabinets, though, we can install a number of different products in your kitchen to give it new life. Among those products are granite countertops, backsplashes, flooring, and sinks. We are a full-service home remodeling contractor licensed, bonded, and insured for work in the state of California and we have been in business since 1983, so you can trust us to provide you with nothing short of The Ultimate Remodeling Experience®. For more information about affordable cabinets from the professionals at Reborn Remodeling Solutions, please call us at 1-877-371-4943 or stop by our 40,000-square-foot showroom and manufacturing facility today. Whether you’re in Los Angeles, Huntington Beach, Placentia, Mission Viejo, Laguna Niguel, Santa Ana, Yorba Linda, Brea, Fountain Valley, anywhere else in Orange County or the entire Southern California area, Reborn Remodeling Solutions is here to serve you. 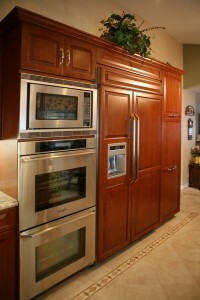 "I just had my cabinets done by Reborn Cabinets with Mario M. doing the installation. My kitchen looks beautiful."